EDITOR: So S. Muriel Murray wants to send the Japs back to the Dust Bowl of Oklahoma, which sent us the Okies? A people whose chance of living, however hopelessly, was swept away from them! Starving slowly, their very homes buried in dust, they listened to tales of a land in the Far West where people, KIND people were begging for laborers. A living was to be had the hard way, but THEY DIDNT MIND THATthey only wanted a chance to exist. Hope dies slowly in the human breastso STARVING AND TRUSTING they started for Californiathe land of promise!! Go read Grapes of Wrath. Its true all rightbitterly so. See the courage and fortitude with which they accepted what life handed out. 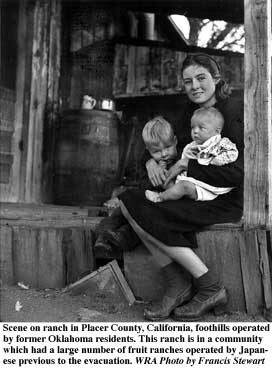 Now that they are needed here, Muriel Murray says, they are going back to Oklahoma. Now that the precious Japs wont be here to raise your vegetables and pretty flowers, let the Okies do it. And then howl because some of them are leaving! More power to those who are going back to their red earth. They have never had your sympathy, but they DONT NEED IT, because back on the prairie, where they were born, and where the tumbleweed blows, the winds of the old Southwest somehow got into their lullabies and put a certain moral fibre there that taught them hard living and doing the best they could with what kind of a hand life dealt them. You say they dont belong in California. More power to you! If all Californians were like you, Ill say they dont either. But dont try to swap them off for a bunch of treacherous Japs, because, they can teach lessons in loyalty, decency and human kindness without any obvious effort.